The Bag O'Nails offers both classic English fare as well as Continental cuisine. A choice of beers, wines, guest ales and spirits is available. Do you work at Bag O Nails? I am a big real ale fan so Bag O Nails ticks the boxes for me, also for its convenient Victoria location. If you are looking for quick bite to eat and a nice pint in Victoria then Bag O Nails is a safe choice. As traditional pubs go, Bag O Nails is not bad at all as it has some really nice real ales and friendly service. A credit to pubs in Victoria. Popped in to Bag O Nails recently while in Victoria and it really is a good traditional pub. The service is friendly and the ales good. Hail to the Ale!!! Bag O Nails in Victoria has some really good beers available and the food isnt to bad either. 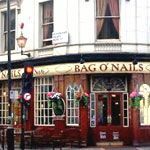 bag o nails in victoria is a good example of a traditional british pub! The food is good and some really good real ales are on offer. Being partial to a traditional english pub Bag O Nails ticks all the boxes for me and has a good selection of real ales available. For all those looking for a REAL pub with good real ales and pub grub, Bag O Nails is the place to go. standard pub, standard pints, nothing out of the ordinary but not bad either. I gave one star because I couldn't give 0 star. My husband and I went there to have something to eat and drink after a long day of walking. My husband is a disabled person, to my surprise no body helped us to find a table. I asked to the bartender that we want to order some food, and she said: "sit down anywhere, so we did. After a while nobody came to take our order. I saw another lady working there, and I told her that we want to place an order. She pointed her coworker saying that I have to go to the bar to order. After that great answer I went to the bar again and I chased the bartender to the other corner of the bar, finally she paid attention to me and took my order. No to mention about the food, what a waste of money and time. I do not recommend this place to nobody. Very bad service, no body care about customers. If you want to be ignored that is the perfect place for you. Not particularly friendly service. If you want to eat, they aren't pleased to have you stay downstairs, but make you climb up to the 2nd/3rd floor. Too many other options. Go elsewhere. Not bad as far as London pubs go. I stopped off on a hot day and had a very acceptable pint of beer.It was a cold pint! Thats something us Northerners aren't used to in London so I was pleasently surprised. Worth a stop off when you're a tourist in need of refreshment.